Body Position Select a moderate weight to lift, if unsure, consult a trainer. Adjust seat height both hands handhold the handgrips with the chest against the pad. Exercise Movement with a controlled movement, palms upwards handhold the handgrips, arms bow and extend, slowly return to start position, stop immediately if you feel pain consult a trainer. - Perfectly integrate 89mm round tube and 50*100mm oval tube, makes the machine look elegant and fashionable. - Small but beautiful design, 100% save club’s space. 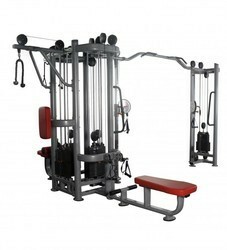 - Double side weight stacks covers, always protecting the user, and makes the machine more beautiful. Here we have brought a strong additive called Strengthex™ for all our precious clients across the globe. An additive that allows processors using recycled blown HDPE to add higher dosage to their Carry Bags Sheets.